English Plum Pudding (M. A. R.) Take the crumb out of a 5 Ct. loaf, soak it over night in 1 qt. new milk. 3 lbs. raisins, 1 lb currants, 1 lb. suet chopped fine, 1/2 lb. sugar 8 eggs, a little salt, nutmeg, & brandy. Thicken with flour enough for a spoon to stand in. This quantity is sufficient for 2 good sized puddings. Boil 6 or 7 hours, the longer the better. Tie the bag tight to prevent swelling Citron is an improvement. 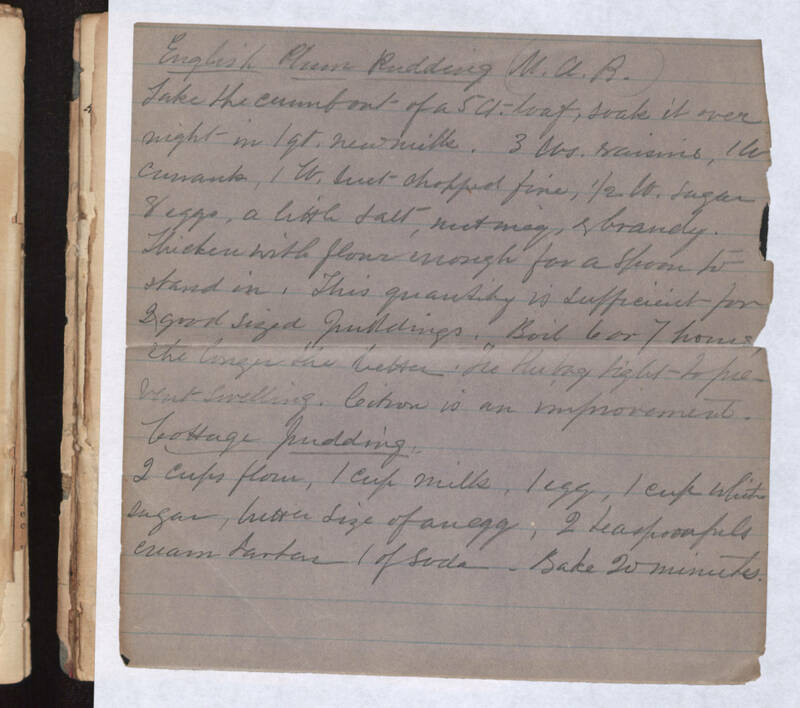 Cottage Pudding 2 cups flour, 1 cup milk, 1 egg, 1 cup white sugar, butter size of an egg, 2 teaspoonfuls cream tartar 1 of soda. Bake 20 minutes.